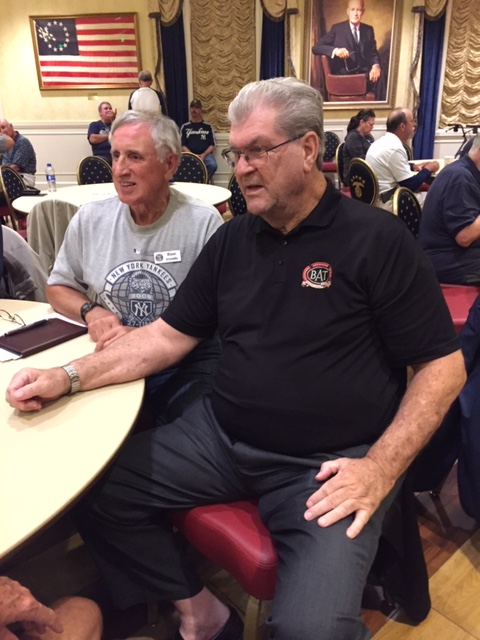 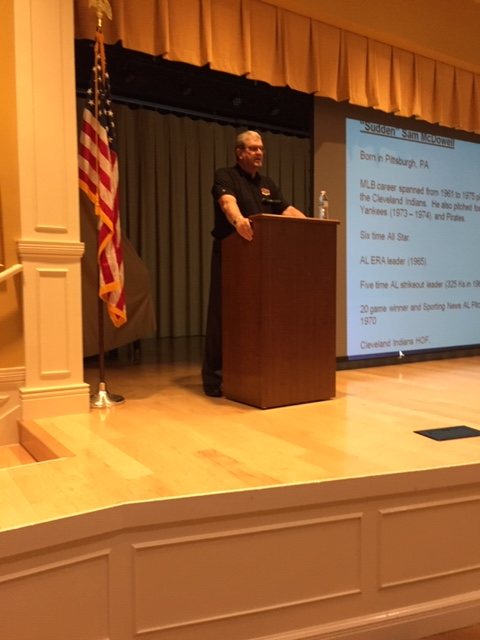 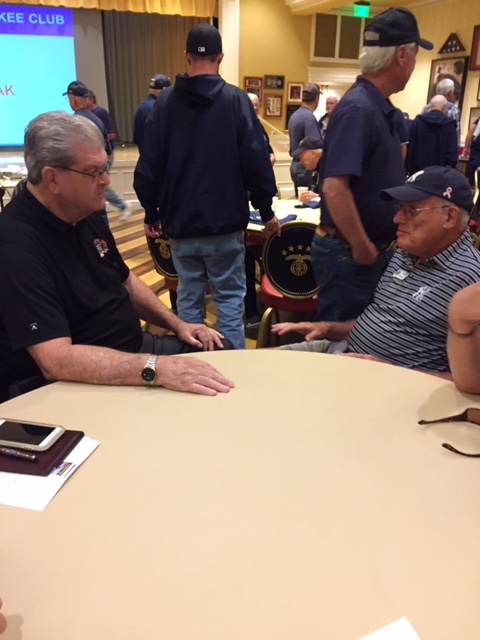 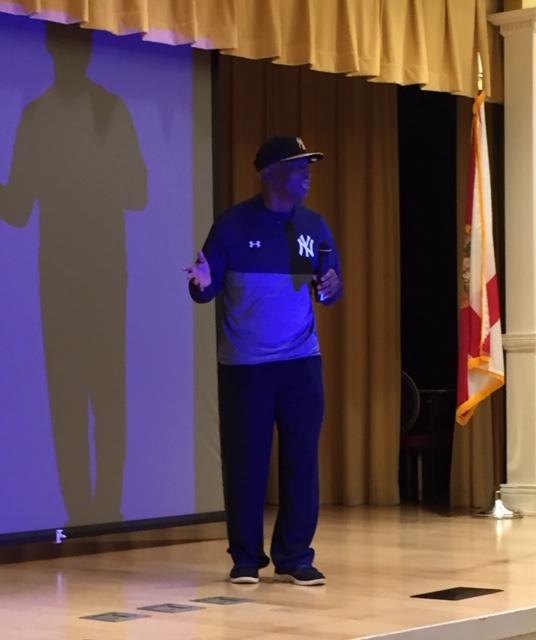 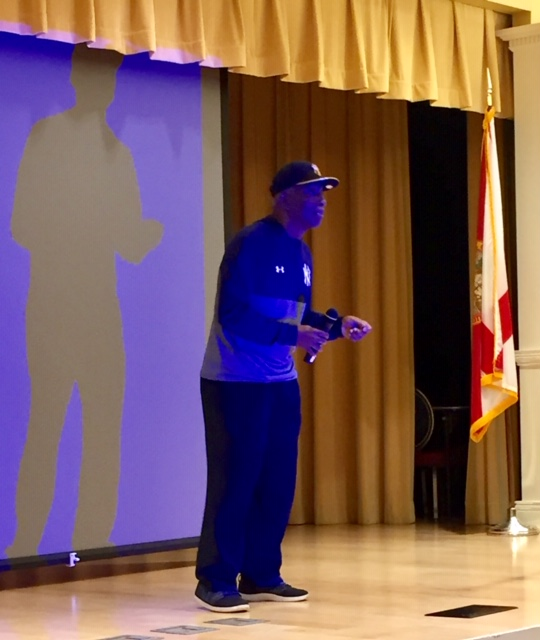 The March 27,2019 meeting featured guest speaker "Sudden" Sam McDowell, former major league relief pitcher for the Yankees (1973-'74), among other teams. 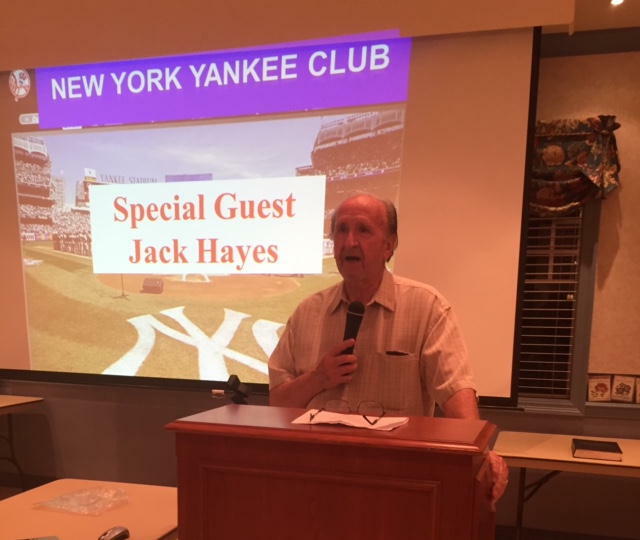 Former Yankee great Mickey Rivers was, once again, our guest speaker at the February 27, 2019 general meeting. 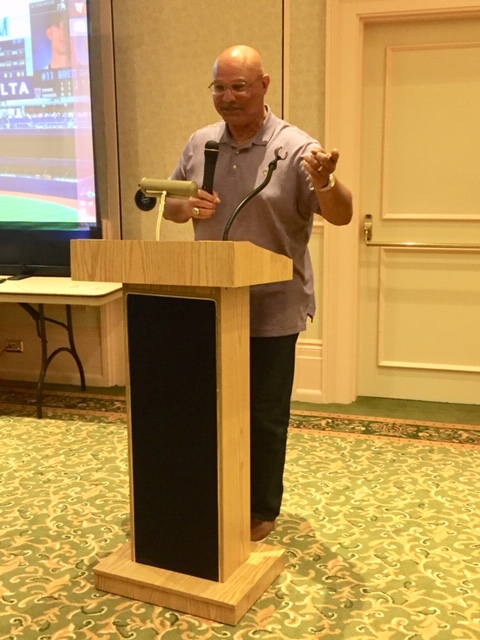 Our special guest speaker at the January 30, 2019, membership meeting was former Yankee great Chris Chambliss. 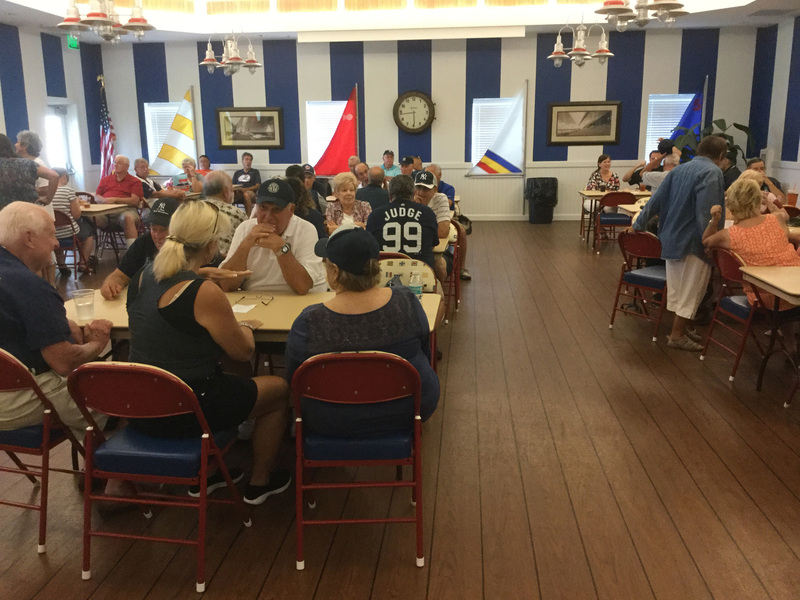 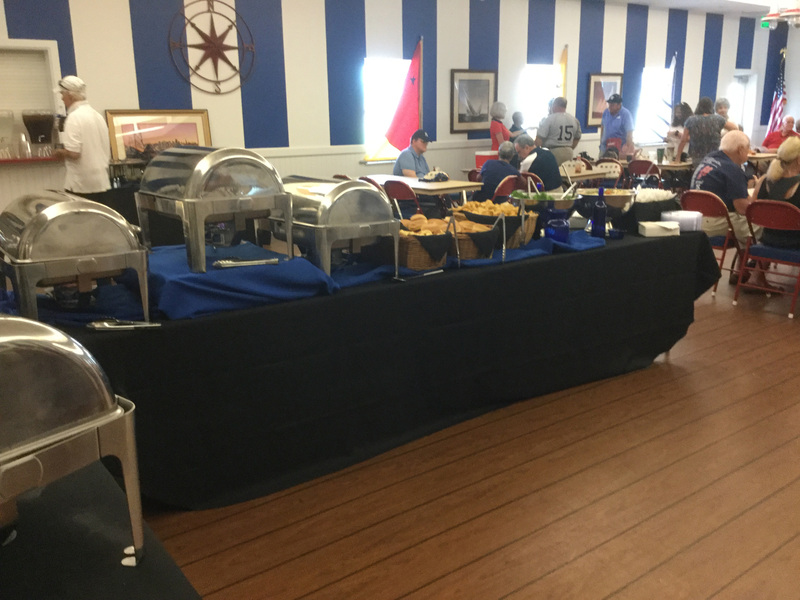 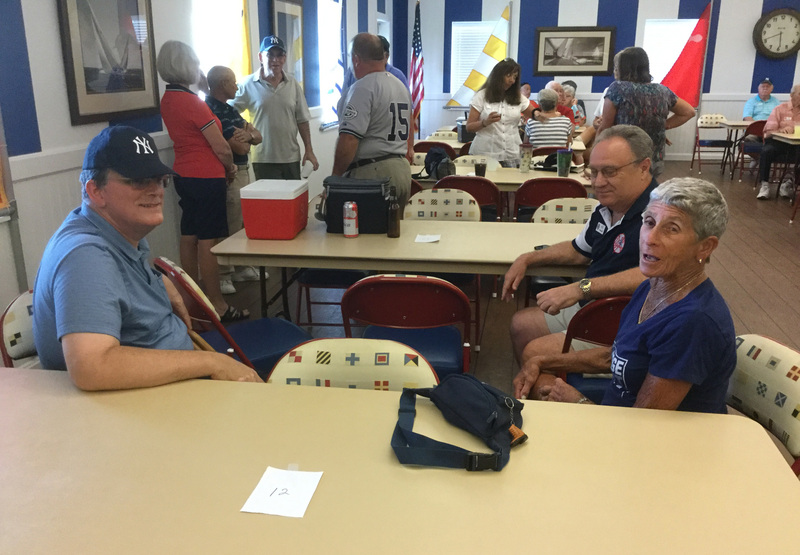 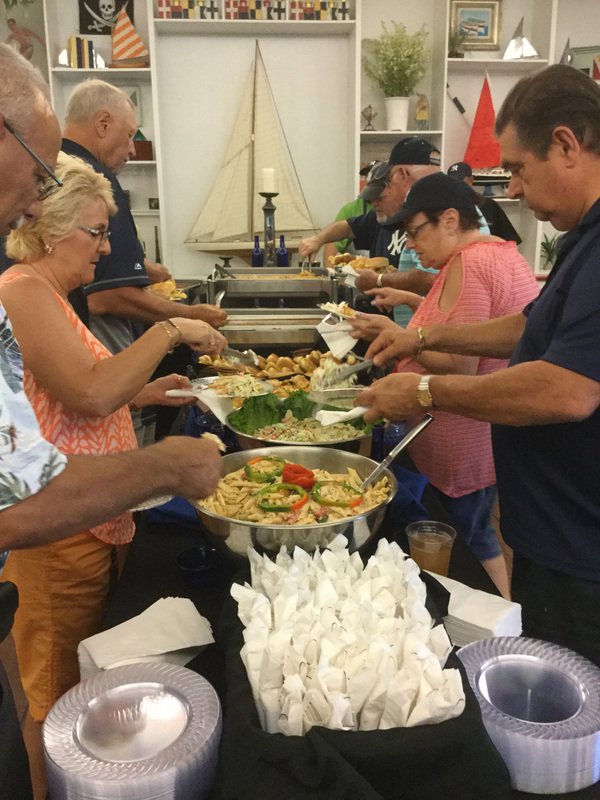 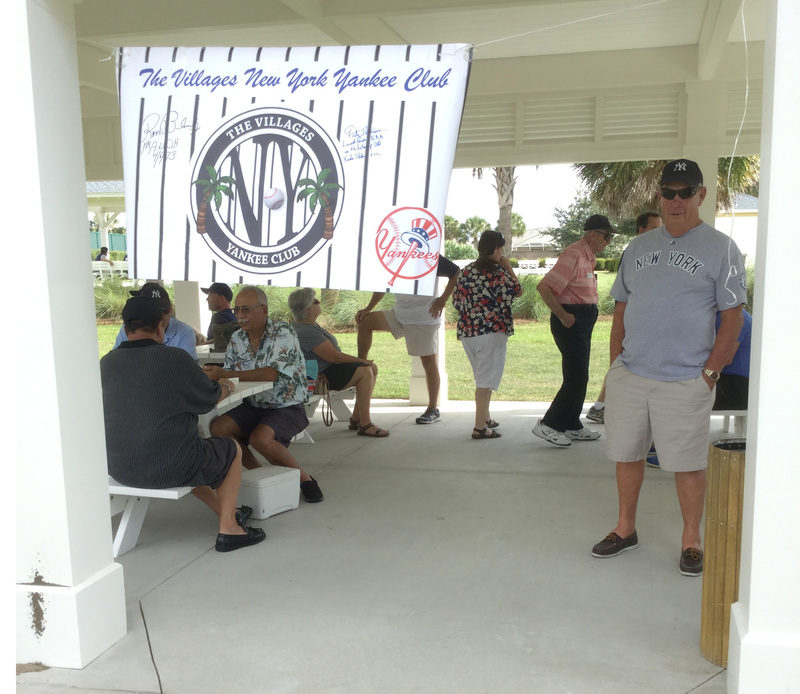 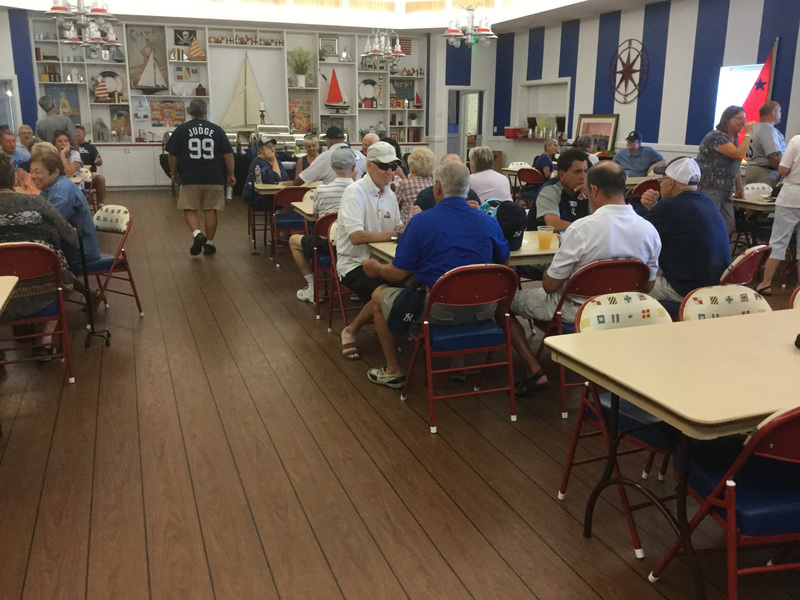 On August 23, 2017 members of the Villages New York Yankee Club enjoyed the annual club picnic held at the Sterling Heights Recreation Center. 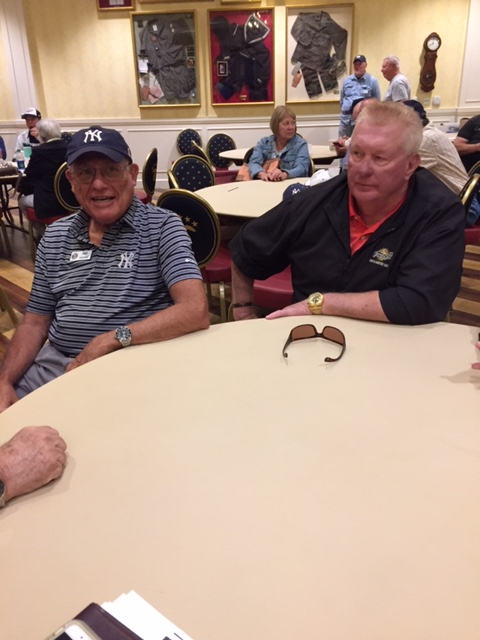 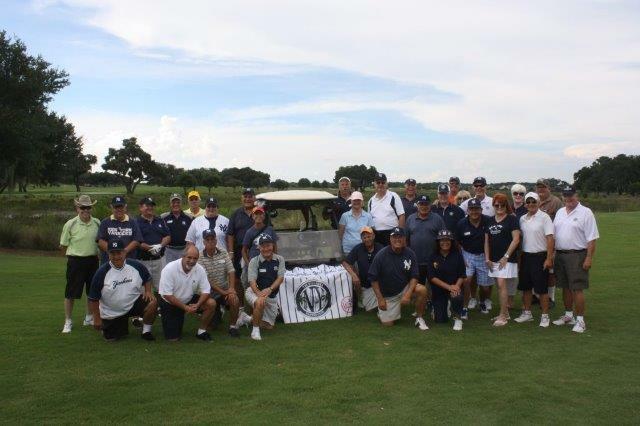 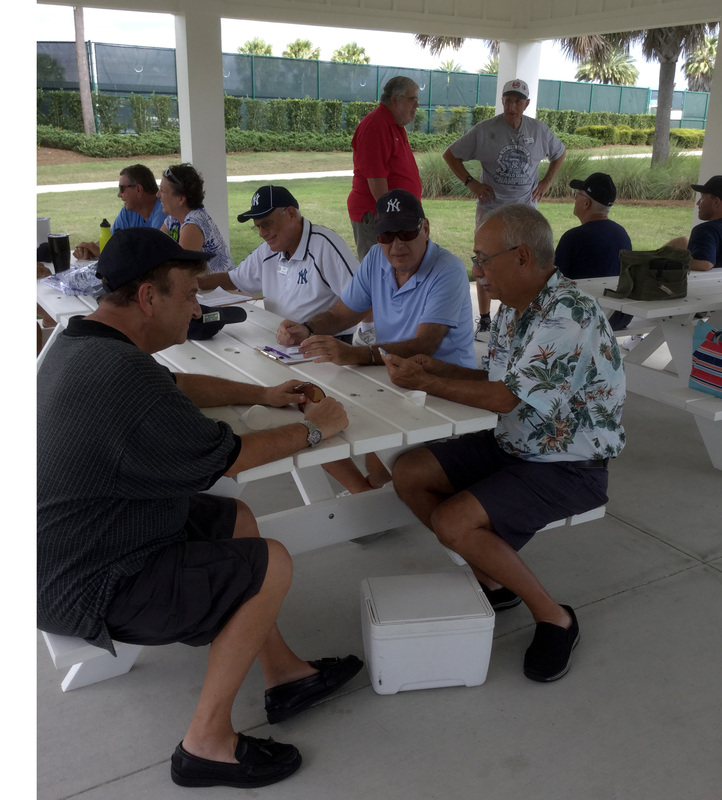 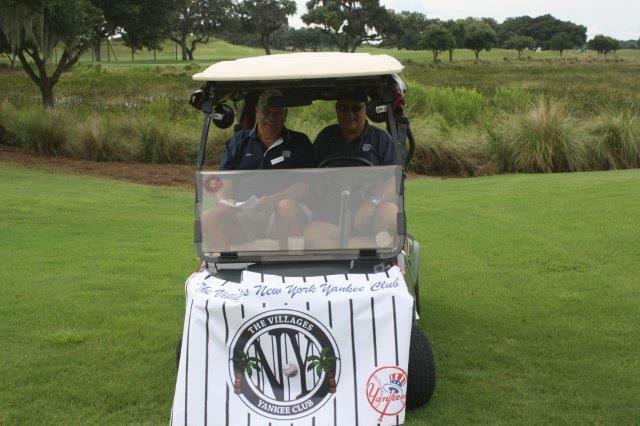 On July 13, 2017 members of the Villages New York Yankee Club and the Villages Boston Red Sox Club "faced off" in a golf match. 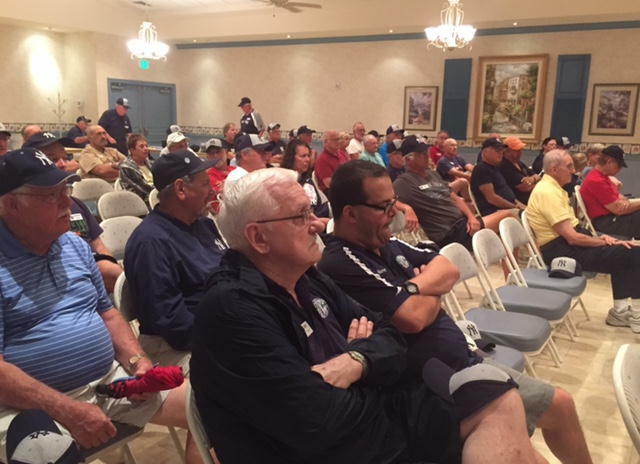 On November 23, 2015 the New York Yankee Club once againhosted Dolly Niemiec Konowski from the All-American Girls Professional Baseball League. 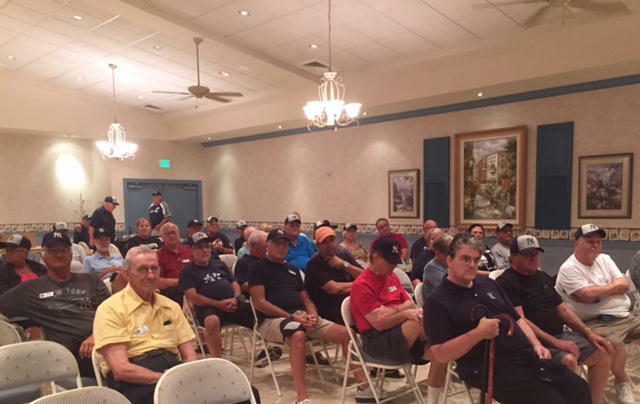 Below are several pictures taken at that meeting. 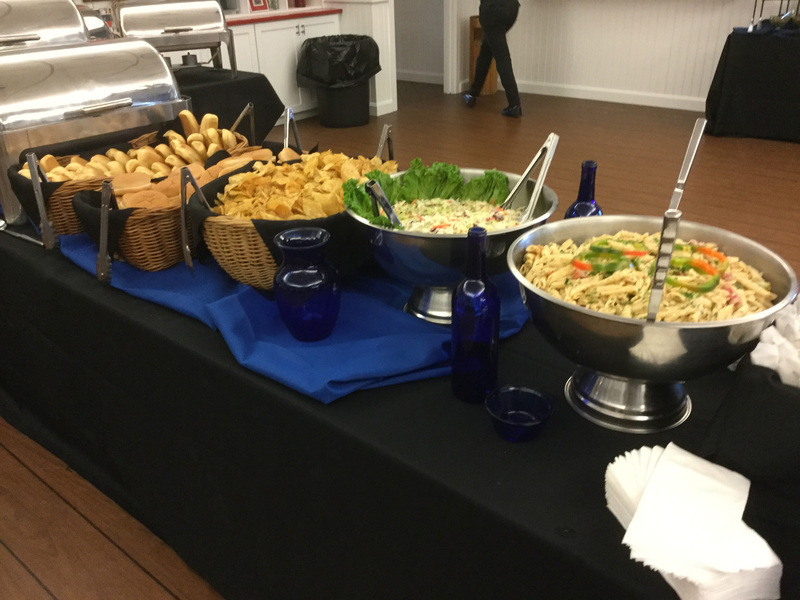 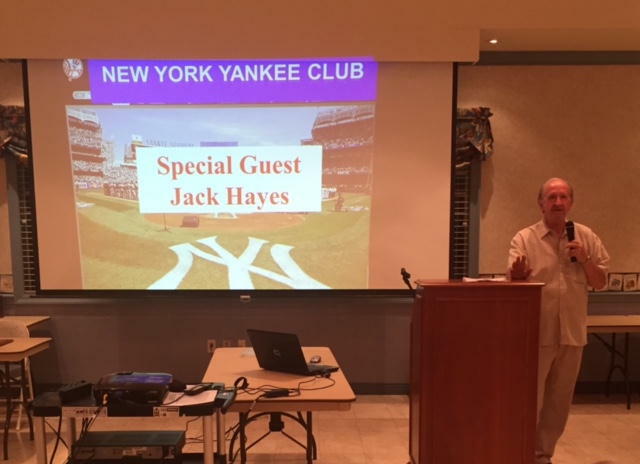 On September 26, 2015 the New York Yankee Club hosted author, Jack Hayes. 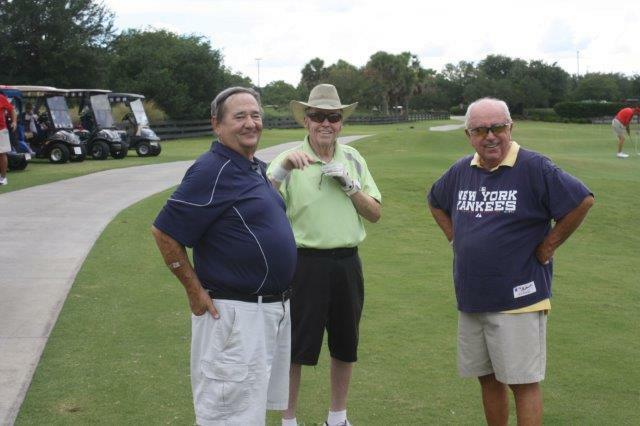 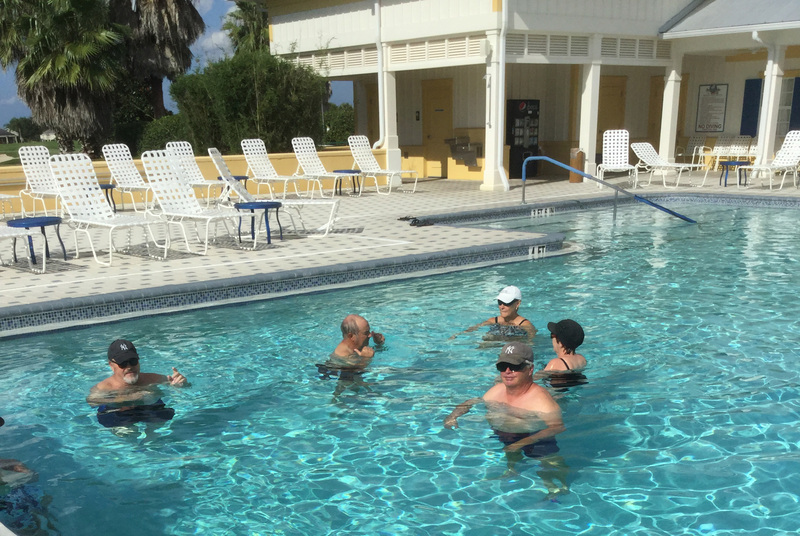 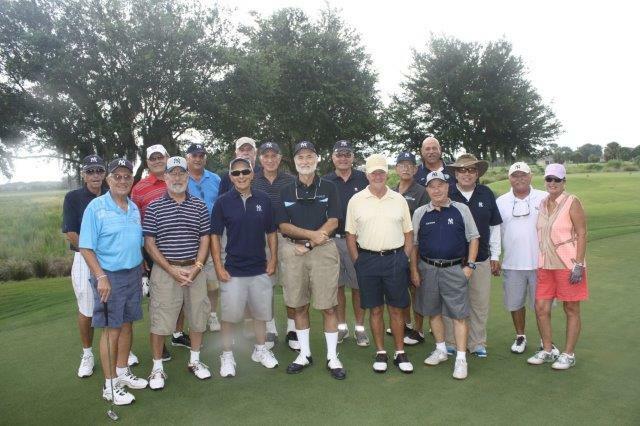 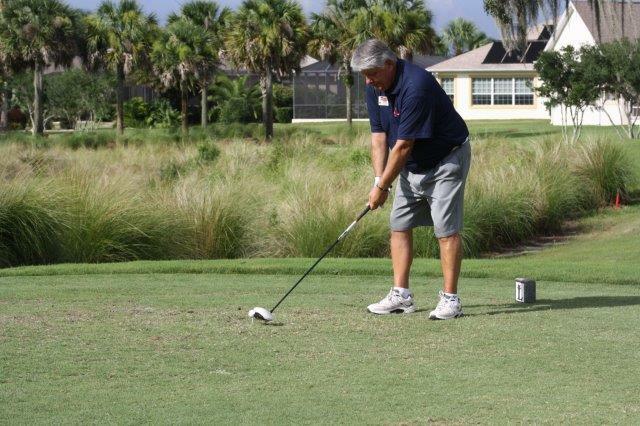 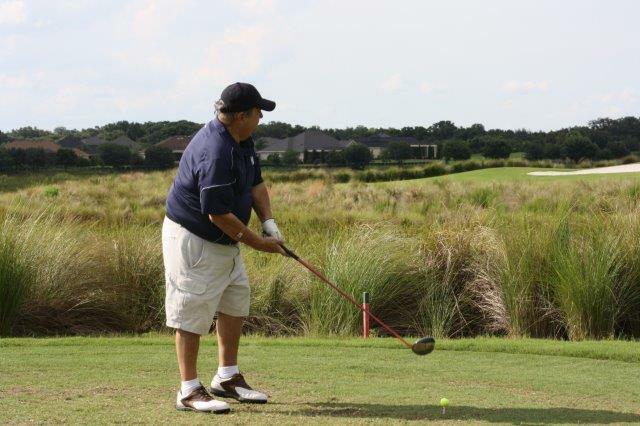 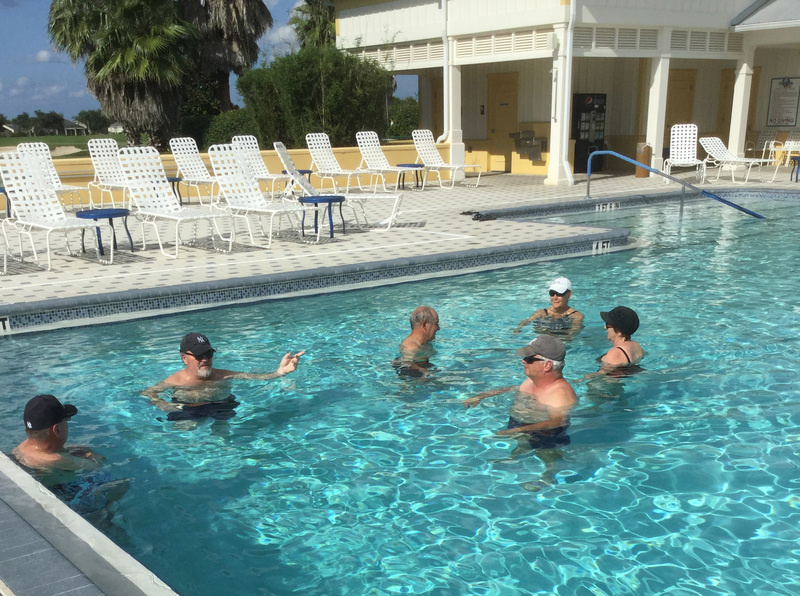 On Tuesday June 9, 2015 members of our club participated in a golf challenge made by The Villages Red Sox Nation. 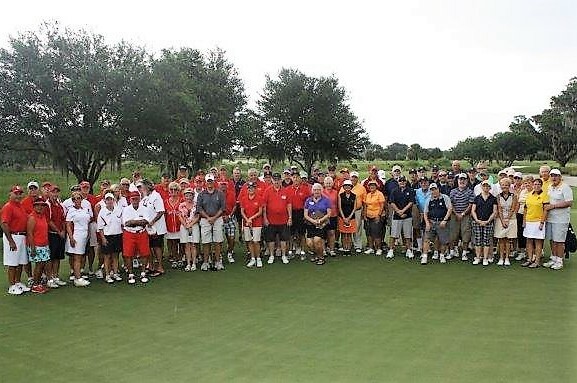 The match was a tie and a good time was had by all. 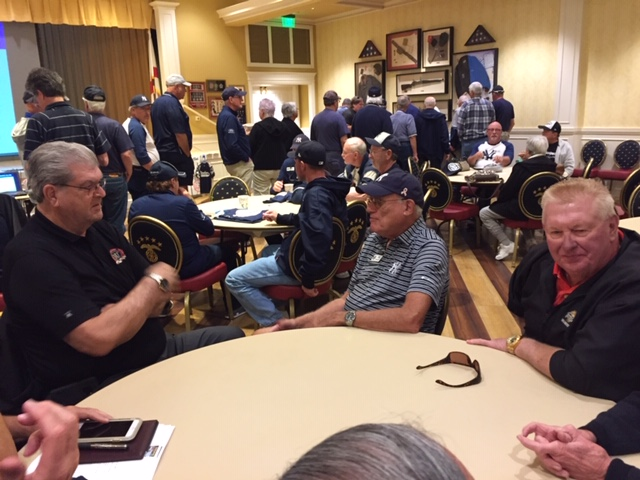 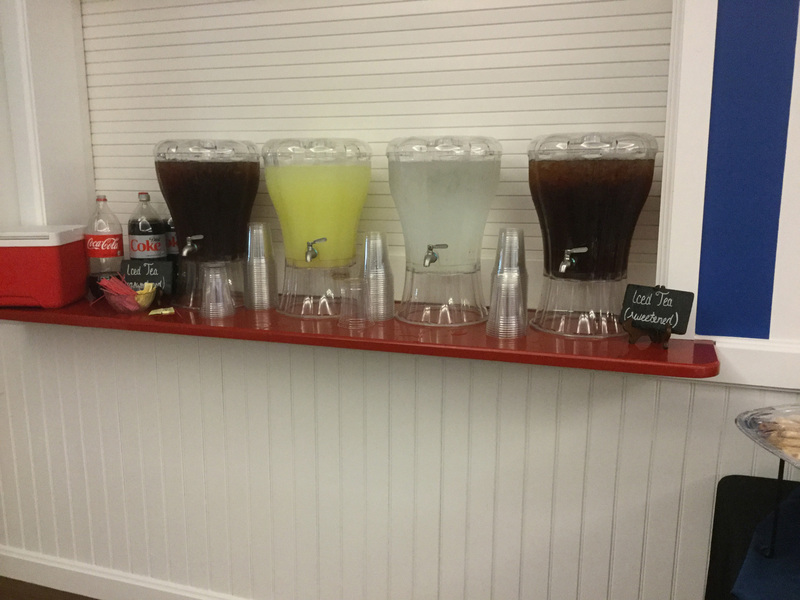 After the match, many of the players and supporters from both clubs, gathered for drinks and dinner on the patio of the Arnold Palmer clubhouse. 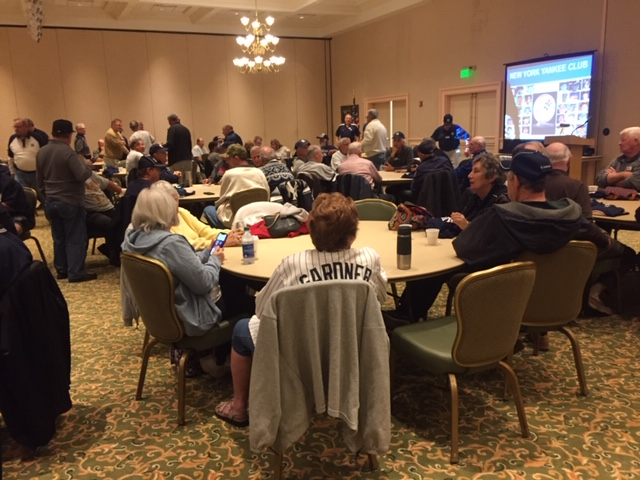 Thanks to members of both the Red Sox Nation and the New York Yankee clubs for all the hard work that went into organizing what many hope to be the first annual event. 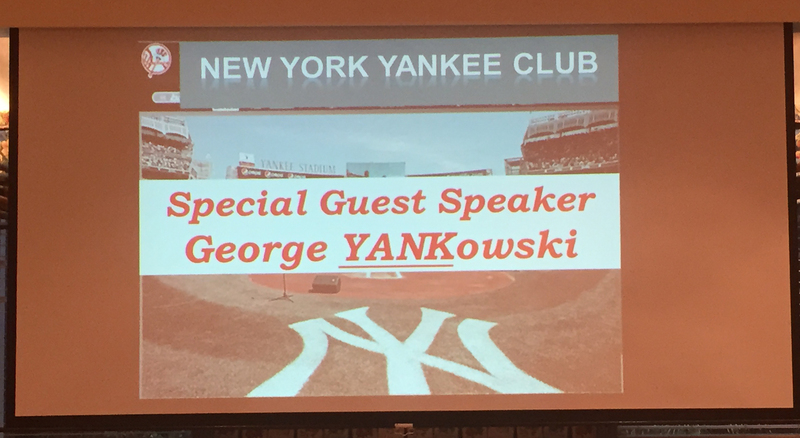 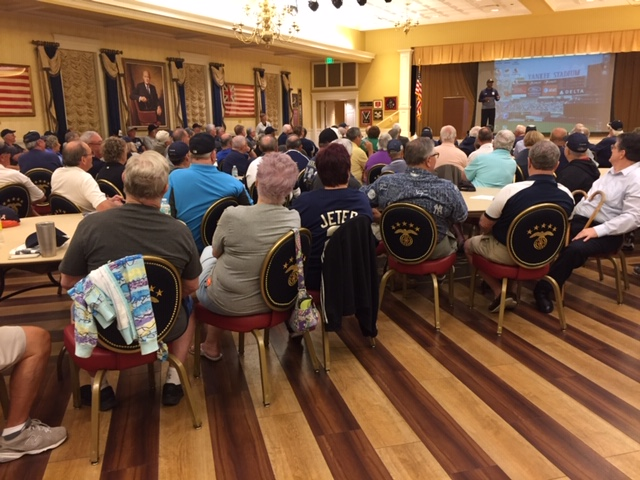 During our April 2015 meeting our guest speaker once again was Villages resident 93 year old George Yankowski, who was a former barnstorming and professional baseball player in the 1940's. 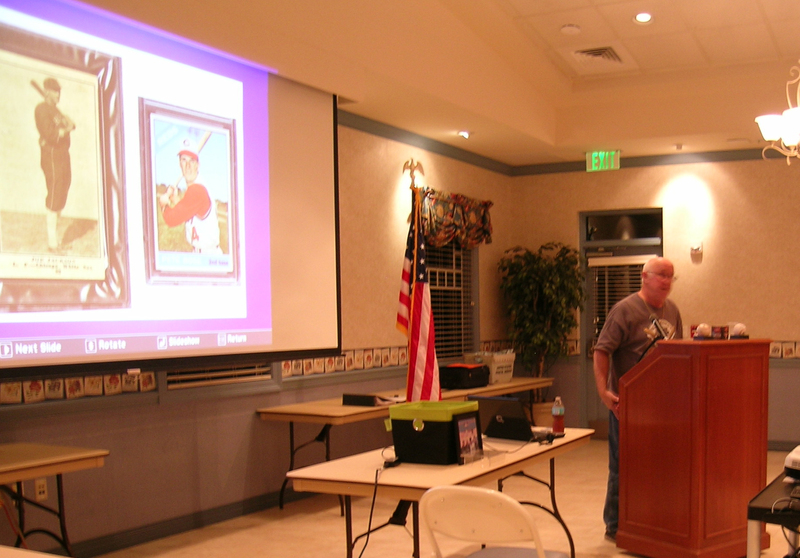 George had entertained us so well during our Janurary 2015 meeting that he was asked to come back by popular demand. 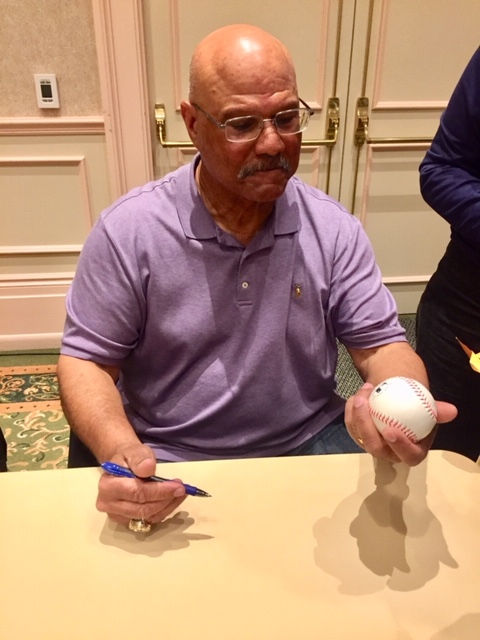 At the regular monthly meeting on Monday, February 23rd, the special guest speaker was Dennis Schrader, the owner of the world’s largest collection of autographed baseballs. 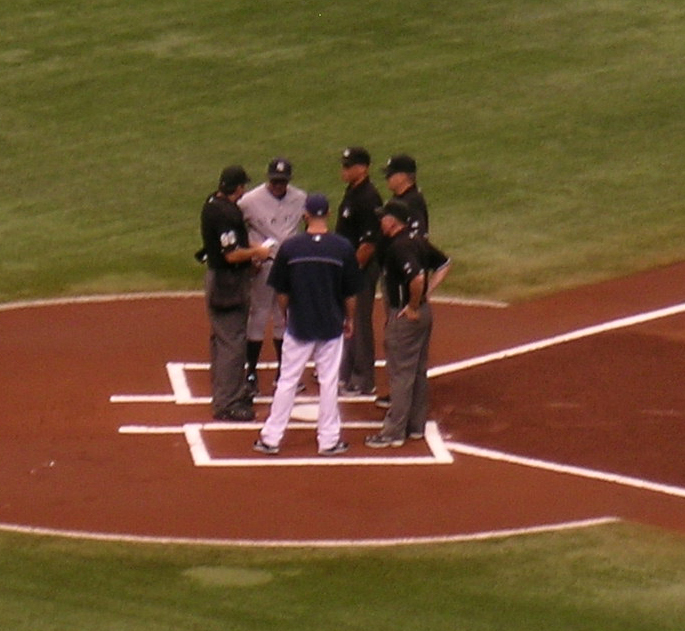 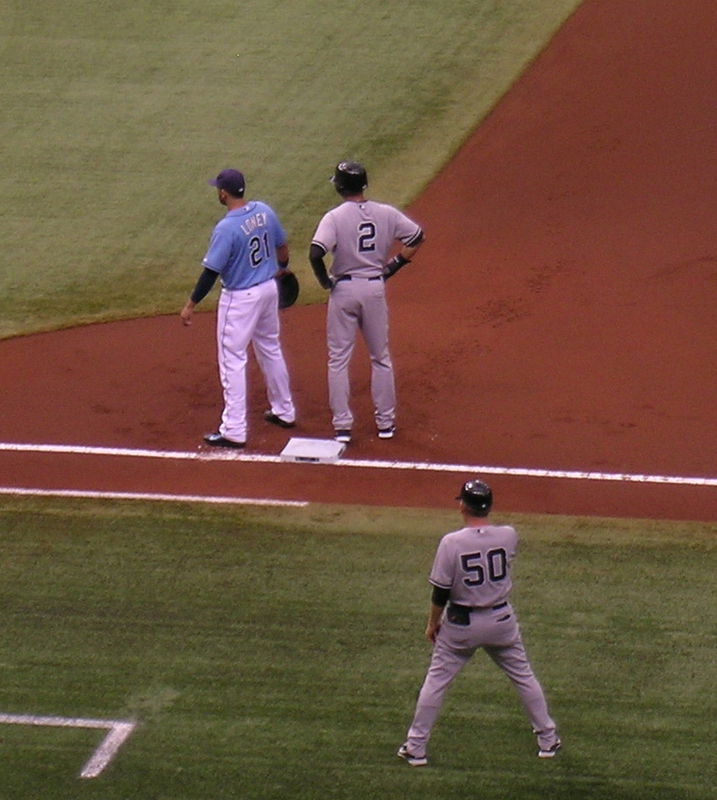 His collection can be seen at the St Petersburg Museum of History, a museum actually supported by the Tampa Bay Rays. 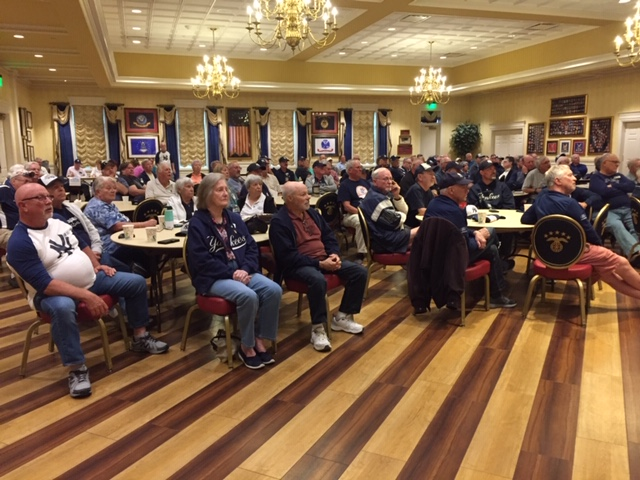 At the regular monthly meeting on Monday, January 26th the special guest speaker was Villages resident 93 year old George Yankowski, a former barnstorming and professional baseball player in the 1940's. 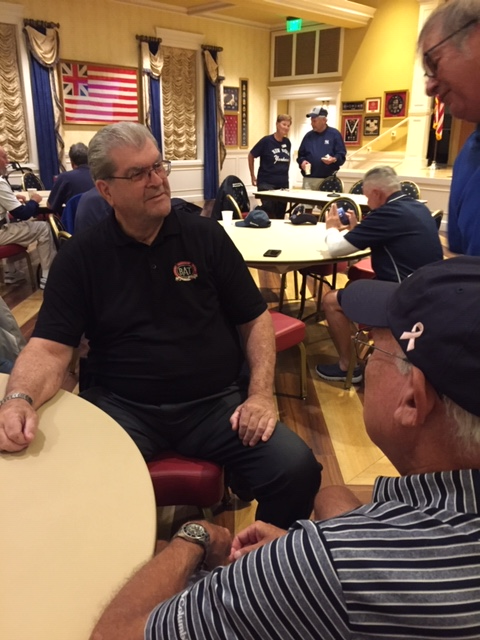 George barnstormed with a team managed by Babe Ruth and had Ted Williams as a team mate. 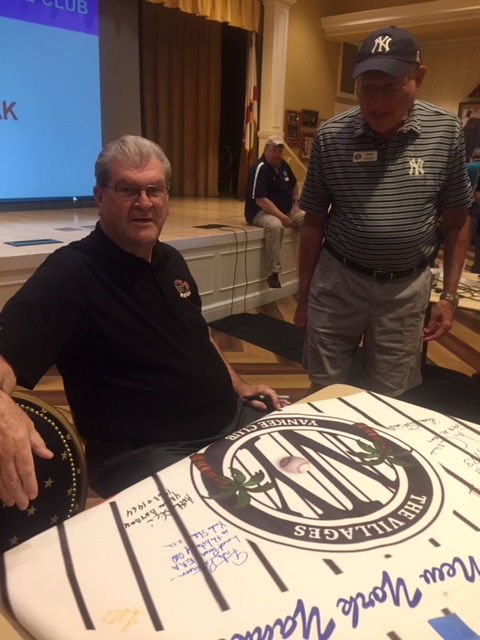 In the late 40's he played for the Philadelphia Athletics who, at that time, were owned and managed by Connie Mack. 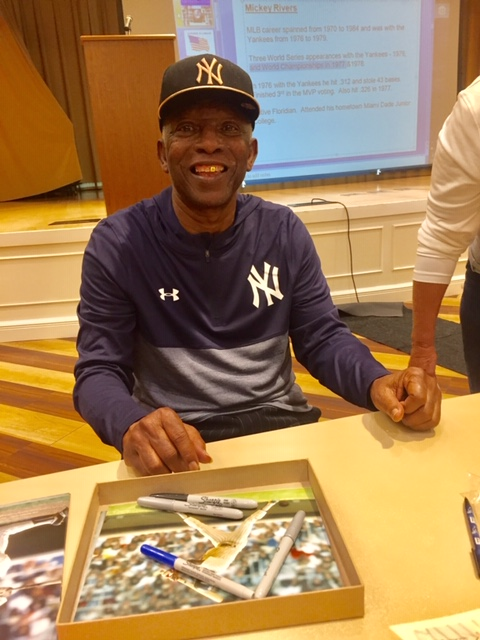 George's connection to three of the most iconic names in baseball makes him one of the most interesting former players alive today. 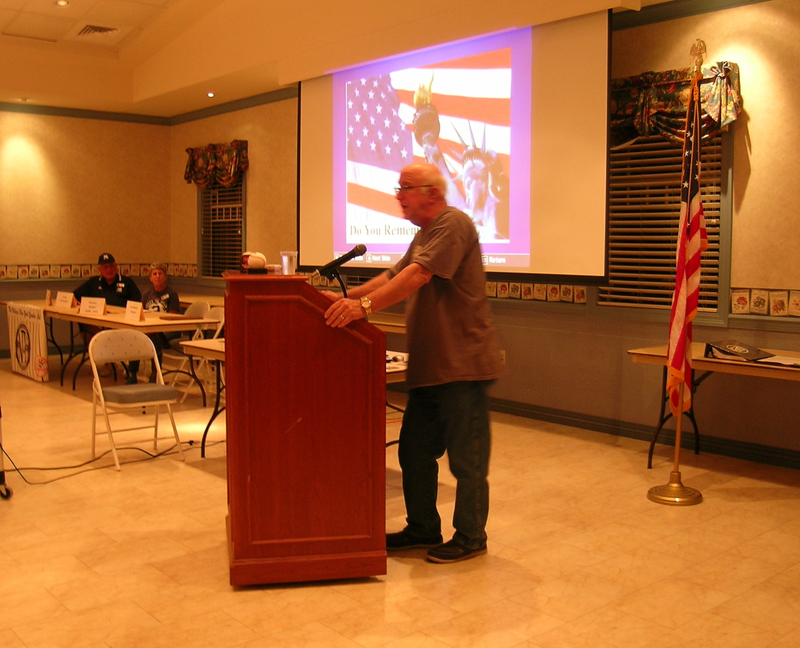 He also recently received the Legion of Honor award from the French government for his activities during WWII. 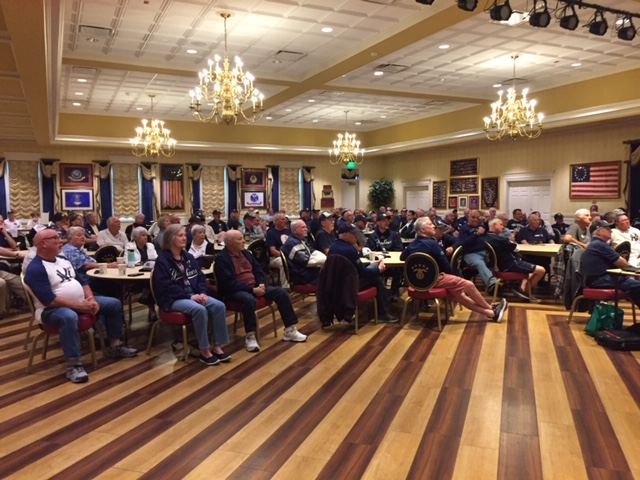 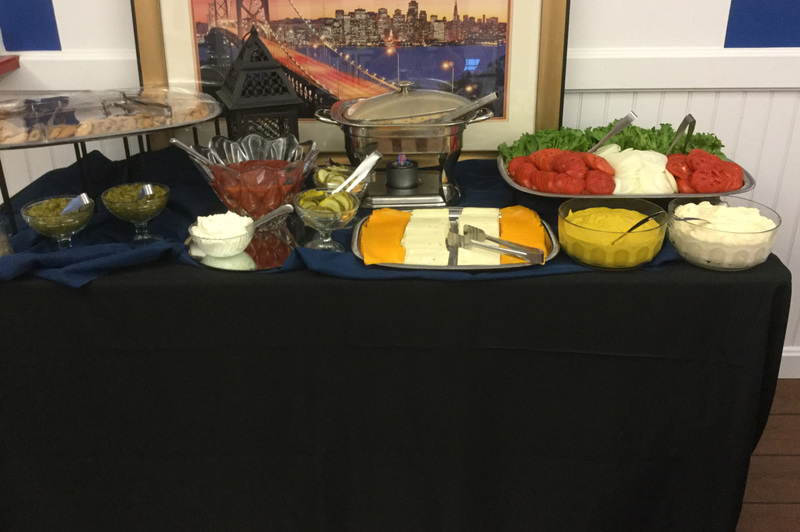 Some Pictures from our November monthly meeting. 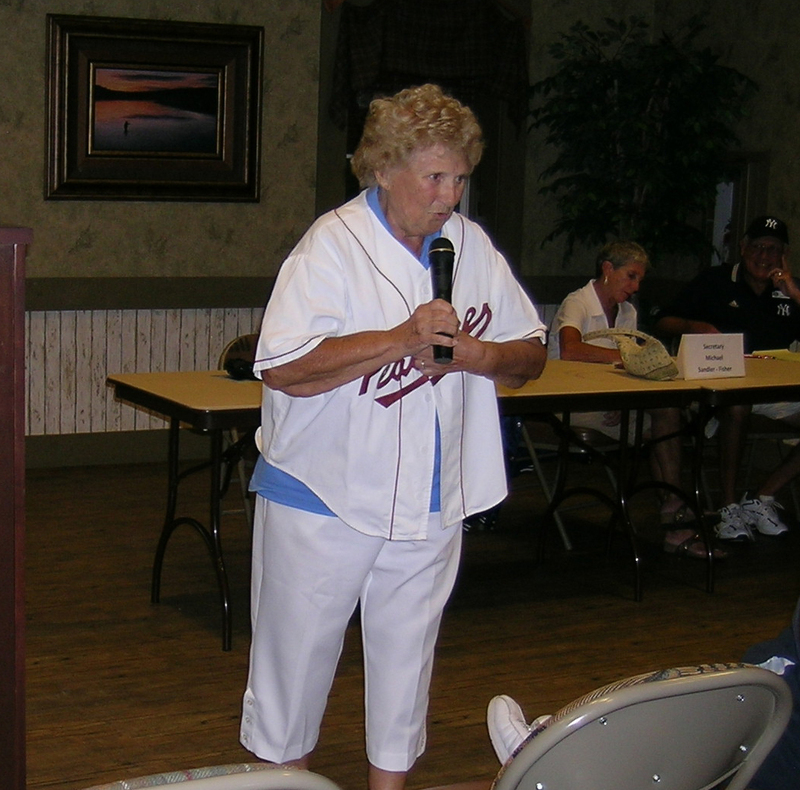 Our special guest speaker at the November meeting was Dolly Niemiec Konwinski. 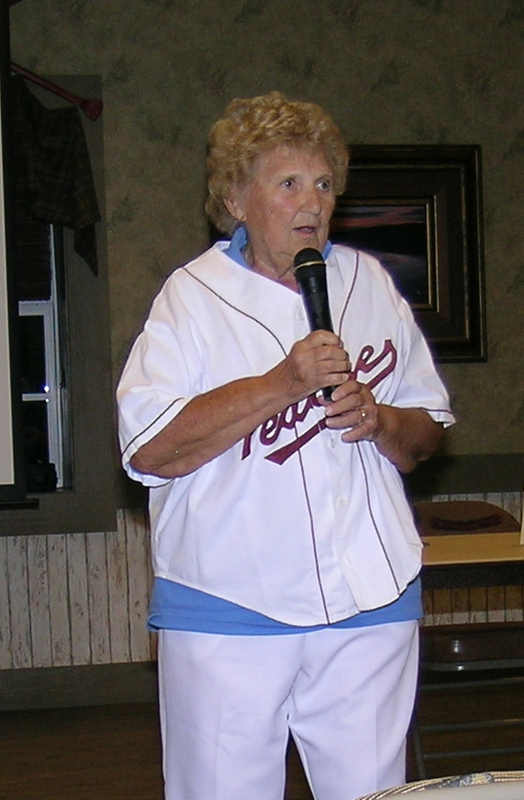 Dolly played for the Grand Rapids Chicks in the All-American Girls Professional Baseball League from 1949 to 1952. 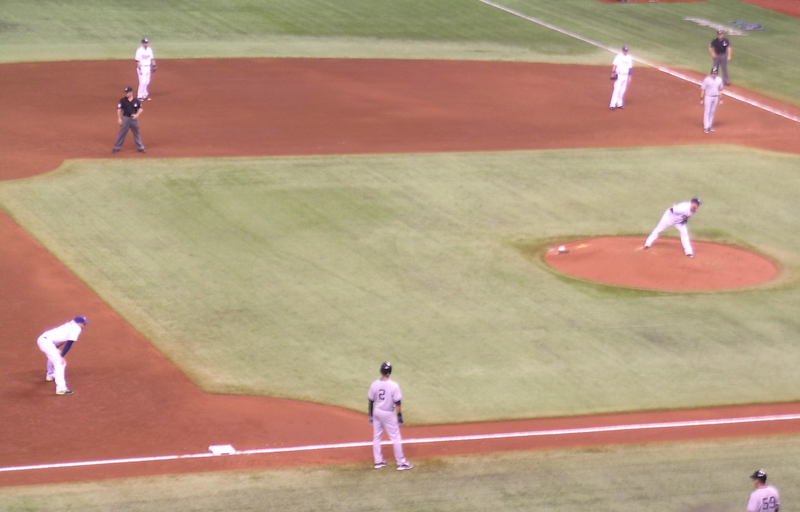 She played second and third base. 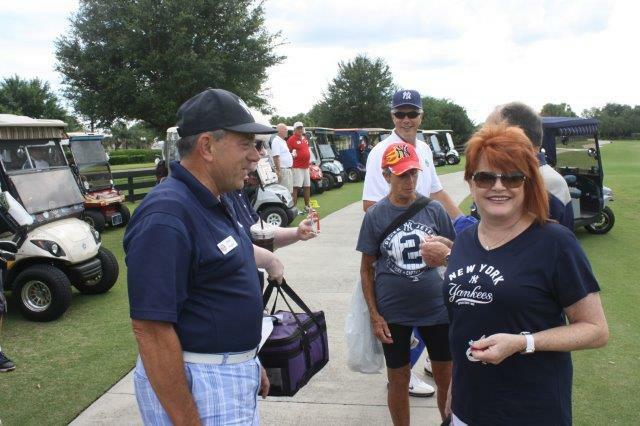 Her career was cut short by an auto accident. 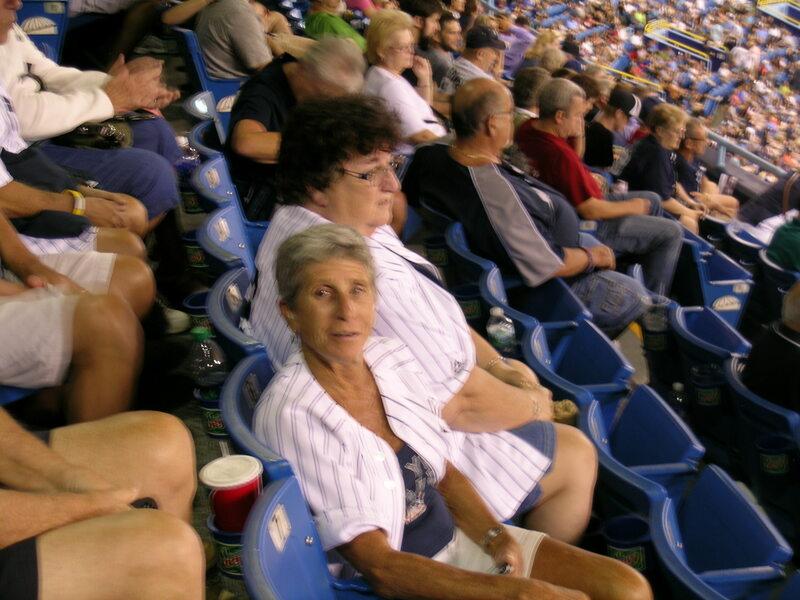 She then became a professional bowler. 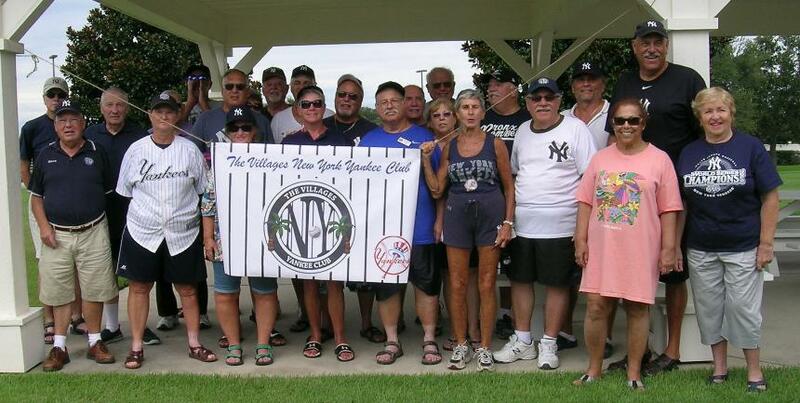 The girls baseball league was immortalized in the 1992 movie "A League of Their Own." 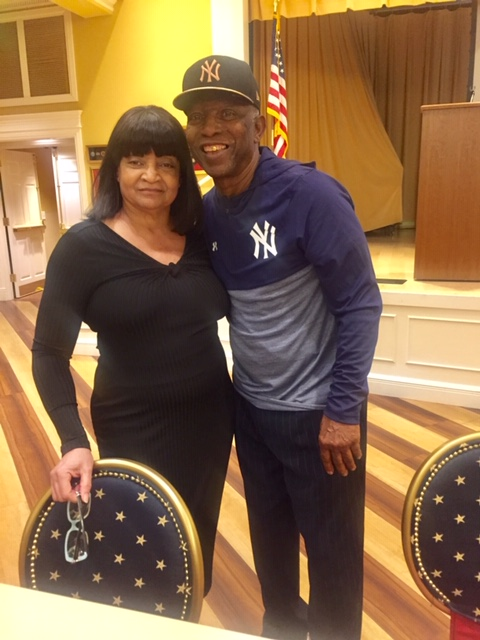 Dolly autographed copies of her book, Summertime Dreams and distributed her autographed baseball card. 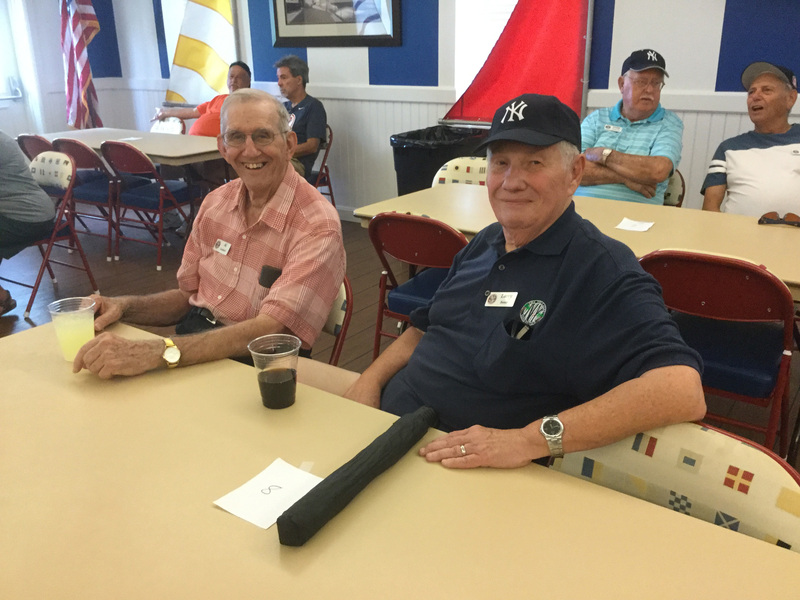 A bus load of club members attended the game against the Rays on Wednesday, September 17th. 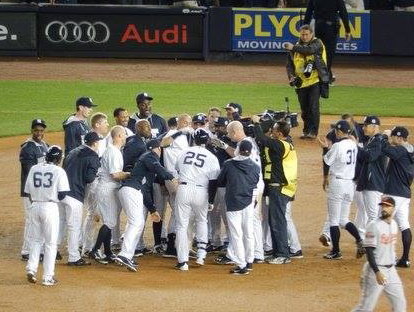 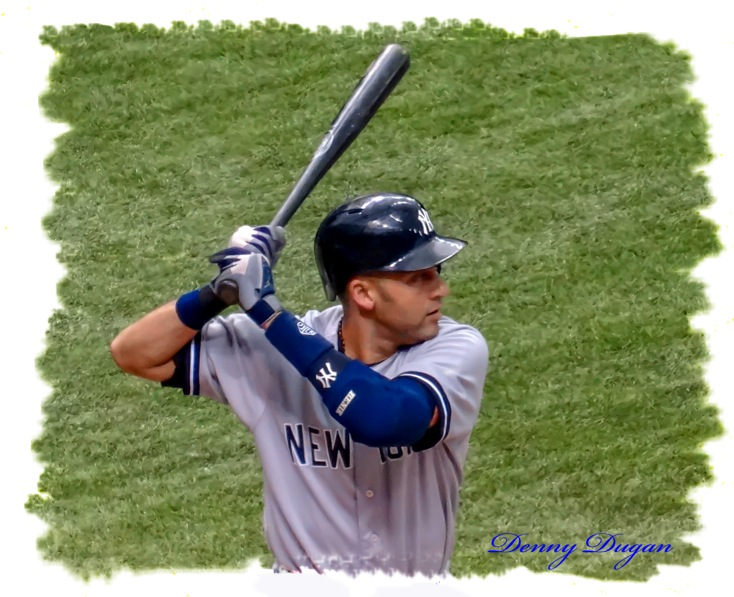 Another Yankee win! 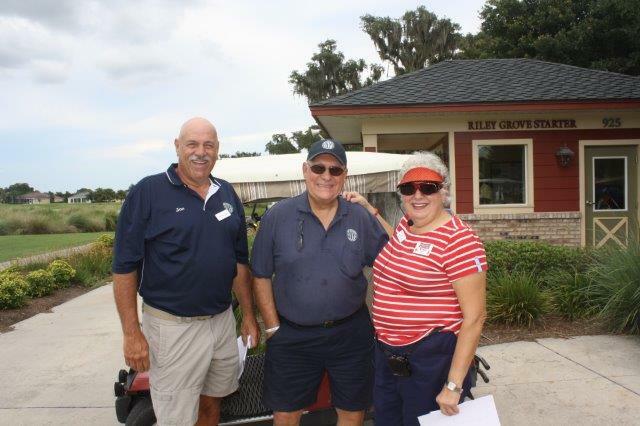 The participants of the ALS Ice Bucket Challenge on Saturday, September 6th. 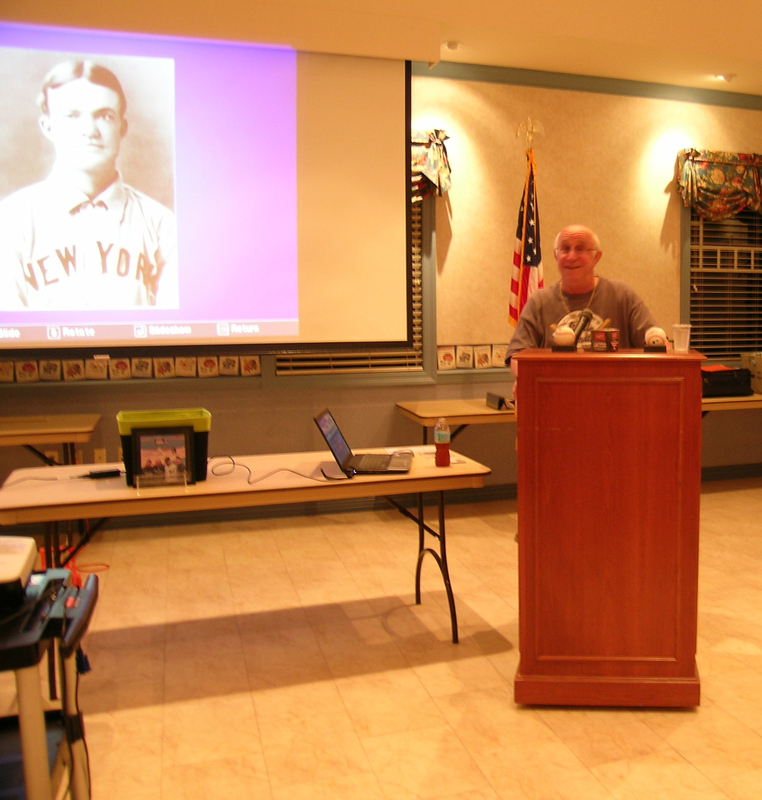 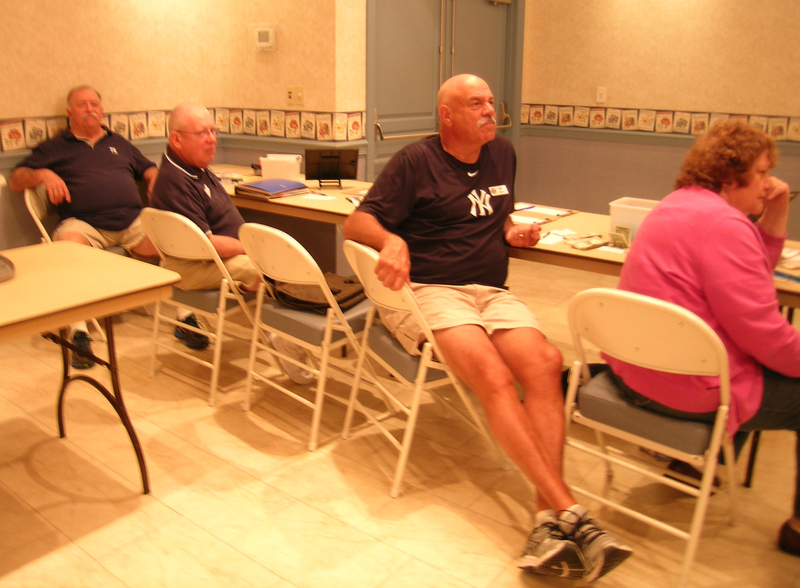 Former major leaguer, Bob Stinson, was our guest speaker at the August meeting. 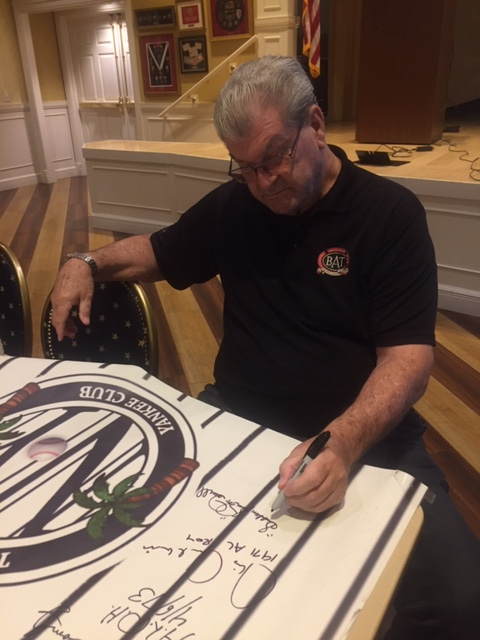 Bob played in the majors for 12 years with the Dodgers, Cardinals, Astros, Expos, Royals and Mariners. 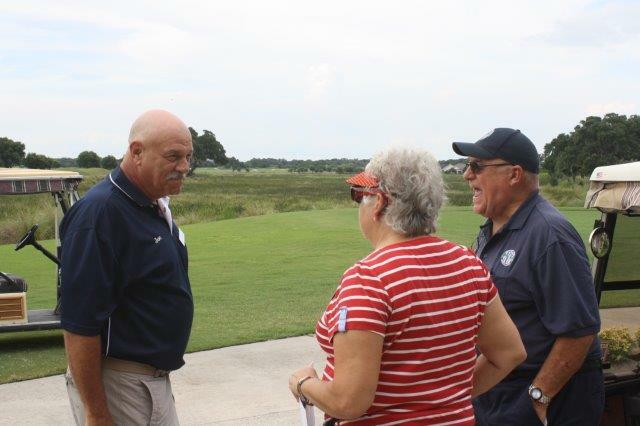 He entertained the members with some great stories of his career. 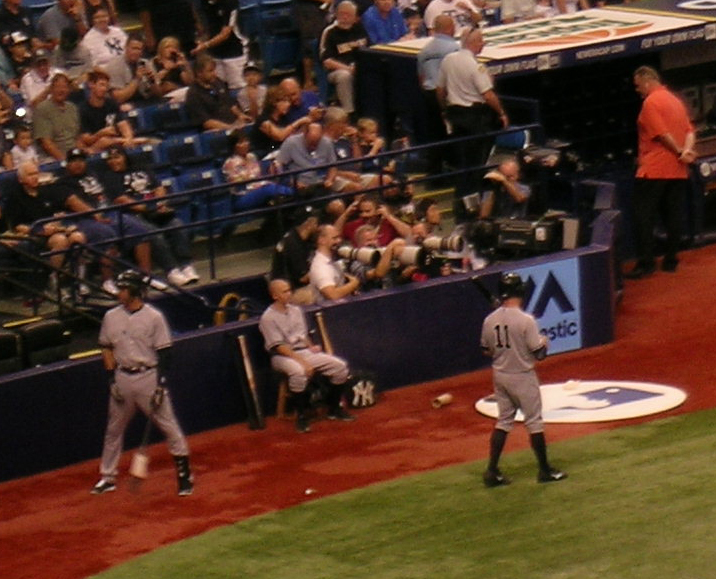 Including, how after hitting 2 home runs and driving in 6 runs in one inning, he was sent down to triple A ball a few days later. 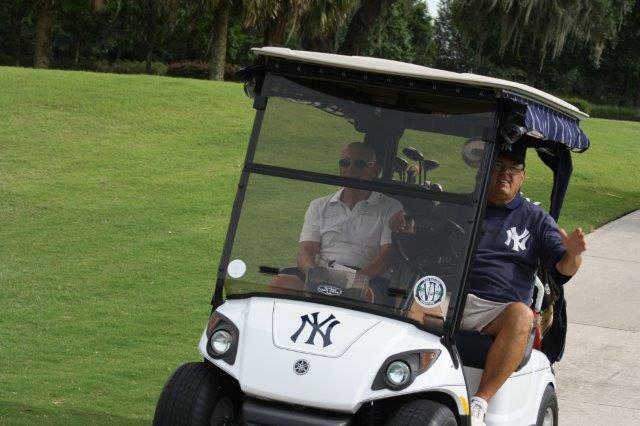 He is a resident of the Villages and is the subject of a book, Extra Innings, by author Joe Bosha (sic). 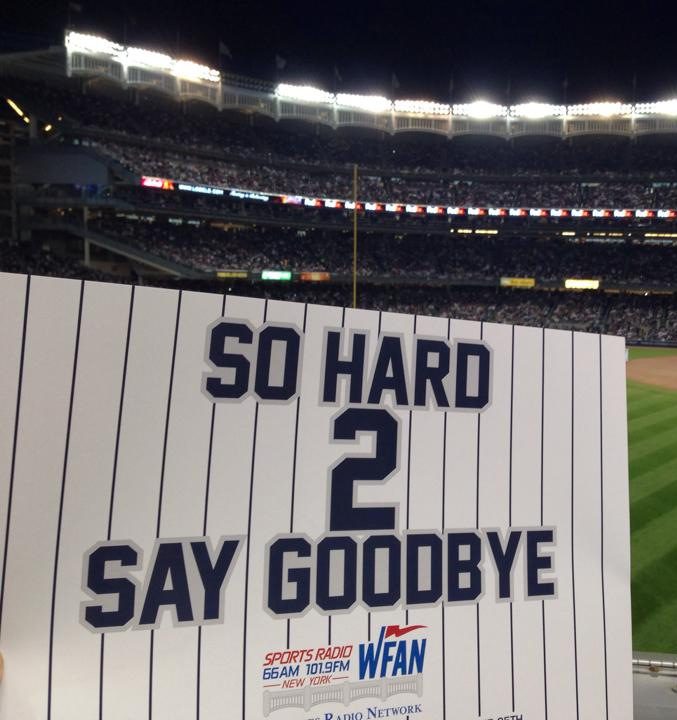 Yankees Win 4-2 and we were there! 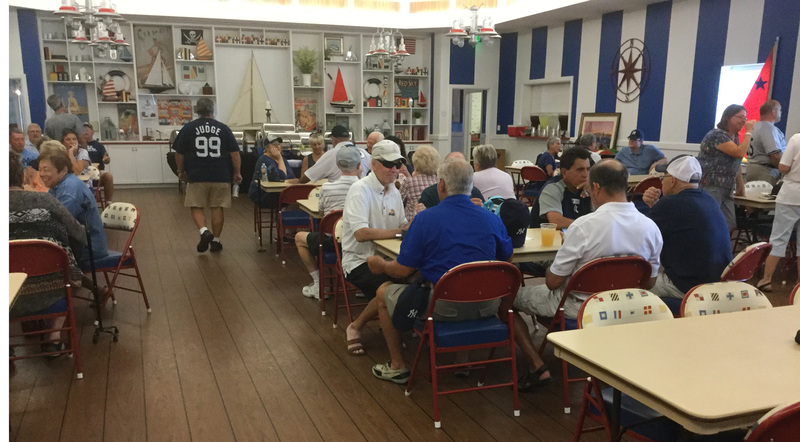 Grabbing a bite before game - What a great looking group!